We’d love your help. Let us know what’s wrong with this preview of Erato by Sharon Van Orman. To ask other readers questions about Erato, please sign up. Does anyone know if there is a way to get an epub version of this book? I have the first one on my Nook, and would like to by the second one for it. This book is enrolled in KDP on Amazon which means that it can't be on other formats. Shoot me your email and I'll get you a epub copy. 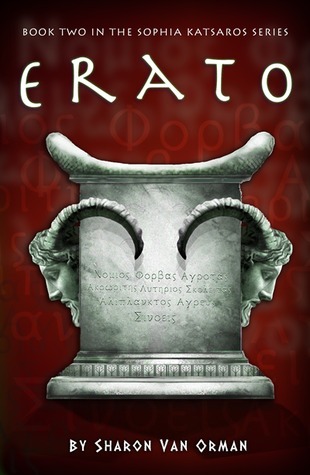 Erato is book 2 in The Sophia Katsaros Series. I had high hopes for this book as I loved Lykaia (book 1), and I wasn't disappointed. After Dr. Sophia Katsaros finds out that both her brothers were killed, she returns home, only to get into serious trouble. She has an unexpected visitor at her own apartment; a series of murders that follow are chilling, especially as they occur too close to where Sophia lives and works. Sophia decides to go to the pack Alpha where she learns that someone is killi Erato is book 2 in The Sophia Katsaros Series. I had high hopes for this book as I loved Lykaia (book 1), and I wasn't disappointed. After Dr. Sophia Katsaros finds out that both her brothers were killed, she returns home, only to get into serious trouble. She has an unexpected visitor at her own apartment; a series of murders that follow are chilling, especially as they occur too close to where Sophia lives and works. Sophia decides to go to the pack Alpha where she learns that someone is killing the pack’s wolves, so she offers to help and find the murderer, provided she is protected by the pack. The investigation that she starts will be filled with lots of surprises and danger. Erato begins at the very moment where Lykaia (book 1) left off. Doctor Kat has arrived back from Greece, having discovered that both of her brothers were murdered in an ancient rite to, supposedly, prolong the lives of a pack of werewolves, alive since the time of ancient Greece, predating our own myths and history of the time. She arrives home to find a wolf in her apartment, having fled Greece and, what she thought, the clutches of the pack, it comes as somewhat of a shock to find a shape-shif Erato begins at the very moment where Lykaia (book 1) left off. Doctor Kat has arrived back from Greece, having discovered that both of her brothers were murdered in an ancient rite to, supposedly, prolong the lives of a pack of werewolves, alive since the time of ancient Greece, predating our own myths and history of the time. She arrives home to find a wolf in her apartment, having fled Greece and, what she thought, the clutches of the pack, it comes as somewhat of a shock to find a shape-shifter waiting for her. I loved Lykaia, it was so refreshing to read a tried and often overused genre and discover something new and exciting. Stripping the lycanthrope theme back to its origins in ancient myth, Sharon Van Orman produced a story laced with intrigue, mystery and no small amount of spine-chilling moments. I’m happy to report that she continues in this vein with Erato. Yet, in book 2 she brings a fresh dynamic to the story. In Erato we learn more about the origins of the wolves, and the magic that created them. The new alpha has sent the pack enforcers, The Efarmostís, after Sophia with one aim, to kill her. When she realises she is being hunted in her own hometown, she does something unexpected, she flies out to confront the new alpha. She discovers that the pack are being systematically killed off one by one and she is the number one suspect. Although they are responsible for the death of her brothers, and she has now killed several of their number with an enchanted dagger, she forms an alliance of convenience with the new alpha. She offers her help as a forensic scientist to uncover the truth about who is killing off the pack in return for his protection against the enforcers and the rest of the pack. As well as a hugely engrossing story, Sharon Van Orman brings her wonderful writing talent to bear, once again, in Erato. Some of her descriptions are simply poetic, yet never over the top. The book is written in first person, bringing the reader closer to the action, experiencing every emotion and moment of tension in full Technicolor. "There is more to life than we can explain." Let me start by saying, I love, love, loved this book! Have you ever found a book that just seems like it was written for you? This book felt like that to me. I loved every minute I spent reading it (even as my eyes started protesting as I read into the wee hours of the morning), and then I immediately went and started rereading it the next day, which I almost never do. This was me after reading it for the first time. It was time to read it again! Done correctly, books about shifters, lycanthropes, werewolves, etc. can serve as a fascinating exploration of what it means to be human. However, most authors I have read either get it wrong (as in they do not accurately consider and depict behavior seen in nature) or merely use the shifting as a "wow" factor with little to no actual impact on the individuals' personalities. This series, however, has the absolute best depiction I have ever seen. I cannot go much into this because of spoilers, but the examination of both the contrasting and shared traits of humans and wolves is excellently done. Additionally, this story focuses on the implications of wolves who have become men. As a result, these werewolves have the ability to take on both forms while retaining influential traits of the other. And that does not just involve having a pack hierarchy but also the inclusion of behaviors and thought processes that are distinctly influenced by their wolf counterparts. There were so many things I enjoyed about Sophia's characterization. For one, she is still grieving the loss of her brothers and unlike so many books that gloss over loss and have the characters move on quickly, she is still grappling with that grief. It permeates her life as a lingering ache that flares up painfully when she comes across reminders of her brothers. I also enjoyed seeing Sophia learn to balance different aspects of her personality: her willingness to stand up for herself while knowing that she has limits, her occasional impulsiveness contrasted with her analytical nature, and her curiosity mixed with her understanding that some things she may never completely understand. Moreover, Sophia never lets herself forget that she is dealing with werewolves. One popular trend that drives me insane is when main characters conveniently forget that they are interacting with shifters until they do something to "remind" them. Being part wolf does not somehow make them less than humans, even if others suggest that—it just means they see and respond to the world from a different perspective. Ignoring those differences is a combination of stupidity (because they are not human and it is dangerous to expect them to behave so) and disrespect (because you are not acknowledging those differences). It ultimately means not accepting them for who/what they are. It was also wonderful to see the author weave together a tapestry of stories millennia apart that share common ties, from the origin story of the werewolves to the events of ancient Greece that developed into the mythology of Sophia's present. I think if I knew more Greek history and mythology I could have appreciated this even more. I have never really wanted to visit Greece before, but these books have awakened a longing in my heart to not only see the land itself but to also explore its culture. The mythology was so cleverly incorporated that a part of me wants to visit just to see if there really could be werewolves. Moreover, learning more about the other beings, such as the dryads, and their inherent connection to nature was wonderful. Relationships tend to make or break books for me, and I was not disappointed. The characters were well-developed, and I thoroughly enjoyed seeing their interactions, especially the growing bond between Sophia and Illyanna and the developing relationship between Sophia and Nic. Their tumultuous interactions made me grin so many times, and I cannot wait to see where the future leads. I know it has been several years since this book was published, but I am still holding out hope for the third book because the ending of this one clearly suggested that Sophia's story was not finished. The last time we saw Dr. Sophia Katsaros, she had just returned from a trip to Greece - where she'd gone to find her missing brothers - only to discover an entirely unwelcome guest waiting in her apartment. She soon learns that she's been targeted by the Enforcers of the werewolf pack who have come after her because no one who learns the secret of the pack is allowed to live. When she begins finding gruesome messages being left for her as warnings, she decides to go to the pack alpha and get him to call off the dogs, as it were. There she learns that her situation is even more precarious because someone has been killing wolves from the pack and Sophia is the number one suspect. She offers the alpha a deal - if he'll call off the Enforcers, she'll prove she isn't the killer, and use her scientific skills to help him find out who is. So begins a uneasy alliance and a trip back to Greece to track down a killer. As in "Lykaia," the story is told from multiple perspectives, with Sophia as the main narrator, written in first person. We also follow one of the Enforcers, see a few scenes from the killer's point of view, and learn more about the Dryad and Dryad magic in general. I found the system that van Orman has set up for the Dryad magic to be quite interesting. I also liked that as skeptical as Sophia was to start with, as she becomes more excepting of the magical world, you can sense a greater openness in her in general. Something I really appreciated was that even though it was obvious that the pack alpha and Sophia found each other attractive, there was no insta-romance to be had here. They were working together out of necessity and each had very good reasons not to trust the other. While their relationship warmed up some throughout the course of the book, it would have felt cheap to have them jump into bed with all of the questions that is still lingered. We also spend more time with Illyanna, the girlfriend of one of Sophia's brothers and mother of her soon-to-be-born niece. The friendship between Sophia and Illyanna is a lot of fun, especially as they learn more about the magical world. There was a natural easiness between them that carried over from the first book as they bonded over their mutual love for Sophia's brother, and I hope that we are not done with their story. Sharon is a full time writer. She lives in Nebraska with her family and a collection of animals including ones that were chosen and others that did the choosing.